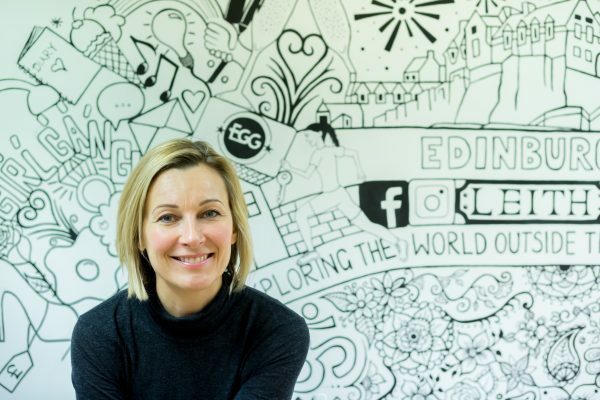 I moved from Glasgow to Edinburgh and was a new mum in a new city, feeling slightly lost and unconnected to the city, when I set up the EGG Facebook page in 2014. Not a fan of search engines, I was keen to find out where girls like me were going for haircuts, good meals and kid-friendly activities. And so initially the group was set up purely to give and get great local recommendations. It quickly became much more than that though, within a few months it was a 5,000 strong supportive and collaborative community, a safe place where girls listened, confided in each other, opened up and shared. I had a full-time job at the time and so the group was my part-time project, it was great fun and we were soon approached by local businesses wanting to offer the group exclusive discounts. As I started to watch the EGG community grow (it now stands at more than 14,000 members) it became clear there were many girls just like me, girls who wanted to connect to other, who were new to the city and feeling lost, many new mums finding their way, and lots working from home or remotely – a large number looking for support, looking for that network, and many girls wanting to take the online community offline. So that became the focus of the business, which we launched in April 2017. Members pay a yearly subscription of £30 which gives them access to curated events and exclusive offers. In the second half of last year we hosted over 20 events, many supporting health & wellbeing with exclusive 10k runs and yoga events, some great networking lunches with female inspirational speakers, shopping events with Harvey Nichols, Coach and Top Shop. But my favourite events by far have been the emotionally supportive ones, the ones that are making a difference – our EGG TALKS events – which cover topics such as grief, anxiety, maternal mental health. Not pink and fluffy but really important. For me, these events have felt like my business ‘lightbulb’ moments, ones that have made no money but are changing lives and making a difference. We now have several thousand members and enjoy great partnerships with companies including Coulters estate agents, The Balmoral, Harvey Nichols, Top Shop, Coach, John Lewis and Harvey Nichols as well as many amazing girl-led independents too. Bringing girls together, supporting them with their businesses, their emotions, their health & wellbeing, and their wardrobes! It’s great fun, I’d love you to join us.